The year 1990 marked the tenth anniversary of the introduction of the recombinant alpha-interferons (IFN-alpha) into clinical trial. Although not fulfilling the expectations of the media that they would be the panacea for cancer, they have become an essential adjunct to the management of a number of human malignancies. The current thrust of clinical development of the IFNs is moving away from single agent usage and towards combined modality programmes incorporating other cytokines, monoclonal antibodies and chemotherapeutic agents. 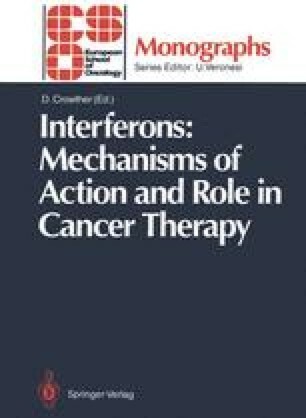 Single agent maintenance therapy with interferon, once a low volume disease state has been achieved by other treatments, is another approach which is proving to be of some value. The aim of this chapter is, therefore, to discuss the available data relating to the use of the IFNs in combination with these other treatment modalities.